The reconstruction of 112 Avenue from 50 Street to 68 Street was completed in 2015. Two other projects added to the scope of the reconstruction of 112 Avenue have also been completed. Rehabilitation of 50 Street from Ada Boulevard to 117 Avenue included a renewed road surface and, where required, the sidewalks, curbs, gutters and streetlights were replaced. 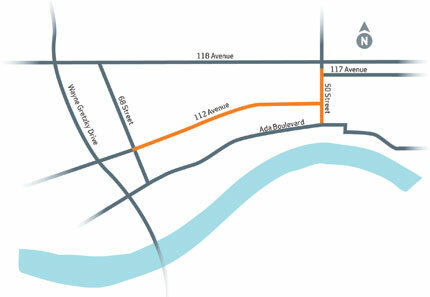 Public consultation on a City proposal for esthetic enhancements along 112 Avenue from 62 Street to 68 Street resulted in upgraded sidewalk surfaces and the installation of benches, bicycle racks and decorative bollards. The enhancements refer to the historical mix of commercial and residential properties along that section of the avenue. The final pieces of street furniture were installed in January 2016.